This editor helps you develop or modify your exploit code on the fly in any language, with syntax highlighting, autocompletion, and handy features like directly adding shellcodes, cyclic patterns and searching for offsets for example. This becomes useful when you have that latest exploit you want to try and it needs to quickly be adapted to the needs of the targeted environment, well we were there before and using Vi, Emacs, Notepad++ could work but if you are serious about it then an editor like this its what you need, one screen with your favourite debugger and the other with Exploit Pack to directly adapt the code as fast as you can type! 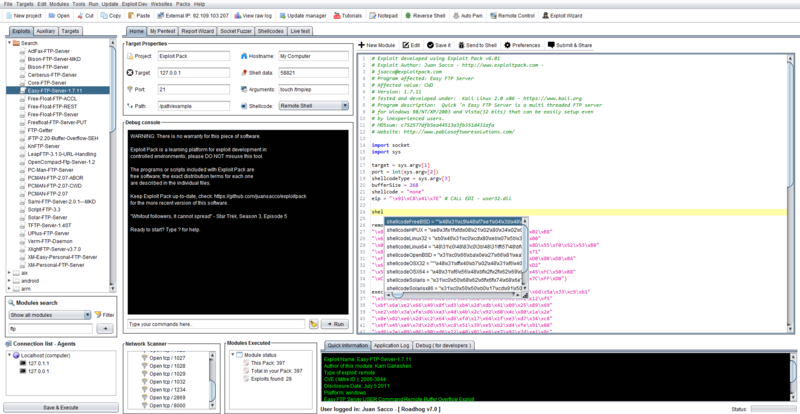 The execution is being handle internally by a System call and the output will be shown on the "Debug Console" that black screen in the middle. How to access the autompletion: CTRL+SPACE and navigate the menu with the arrow keys. After you have edited your exploit just click on the "Save" button to store your changed in your computer and/or click on Save/Execute in the left-bottom part of the screen to do what the button claims!